Here is a seldom-seen full-sized Chelsea banjo with a ship's bell-strike movement. 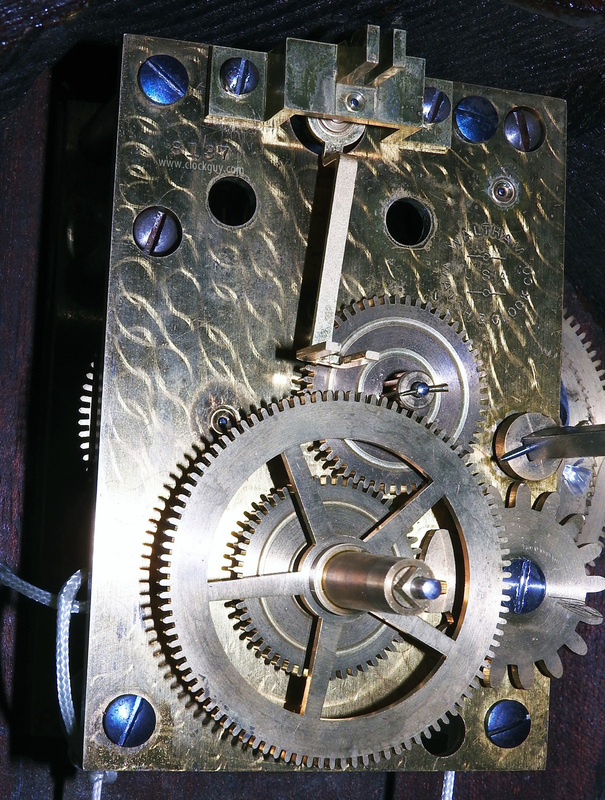 Simon Willard, member of a noted line of Massachusetts clockmakers inspired this skillfully executed reproduction of his original clock. The Chelsea marine-grade ship's bell movement and selected hand-rubbed mahogany of the case combine to make this clock an ultimate achievement of the clockmaker's art; a legacy of pride in American craftsmanship. At the turn of the 19th century when homes were furnished more luxuriously, Willard's clocks provided a classic design with mechanical excellence. "In every respect, a fine reproduction of Simon Willard's 'improved timepiece', patented in 1802. The case is hand-rubbed mahogany, with polished brass trim. 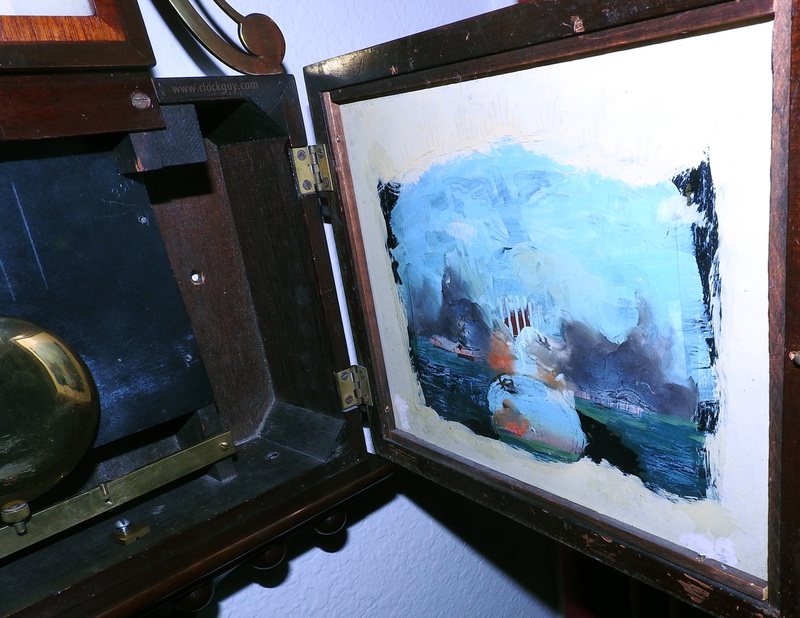 THe glass panels are authentic reverse hand-painted, in oil colors. Movements: 8-day, springwound 11 jewels." Physical: The full-sized (not 3/4) mahogany case measures 10"w x 43"h x 3.5"d and is in excellent condition with original finish. 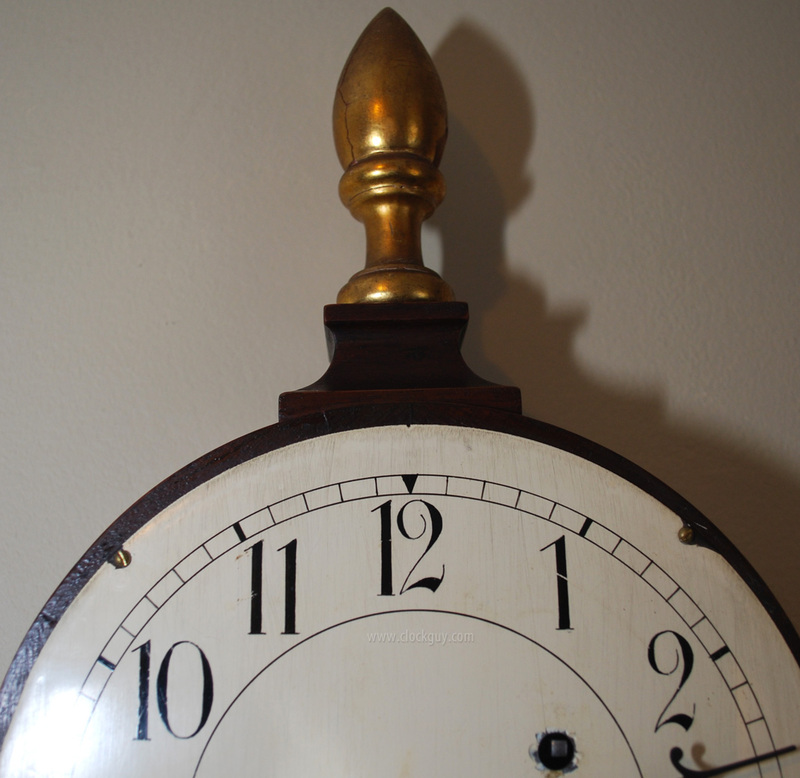 There is a small (old) repair on the tail noted in the photo of the base of the clock (gotta look for it to notice). The 7" diameter dial is in excellent condition and had the original paint. The hand-painted throat and tablet glasses are original an both in excellent physical condition. 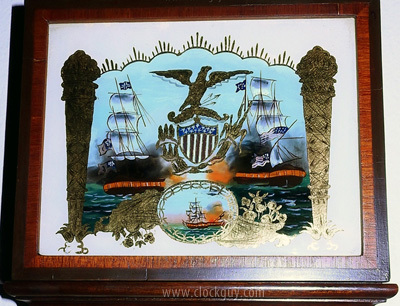 The tablet features the very popular War of 1812 amazing battle between the USS Constitution and the French frigate HMS Guerriere (we prevailed)! There is a stamp at the bottom of the base inside that we can only read the last letters " - - ZZANO". Not sure what it says or what it represents! Mechanical: The eight-day ship's bell movement was recently professionally lubricated and adjusted and is in excellent mechanical condition. The signed movement bears serial number 717441 which puts its date of manufacture in 1968 (see date chart on Chelsea Reference Library page). Comments: Great clock, fabulous condition. Difficult to find. Ready for you! If you're not familiar with intriguing Elmer O. Stennes story, then you're in for a heckuva read as you check out his history, wonderfully written by Jean Schinto, and used here with her permission. 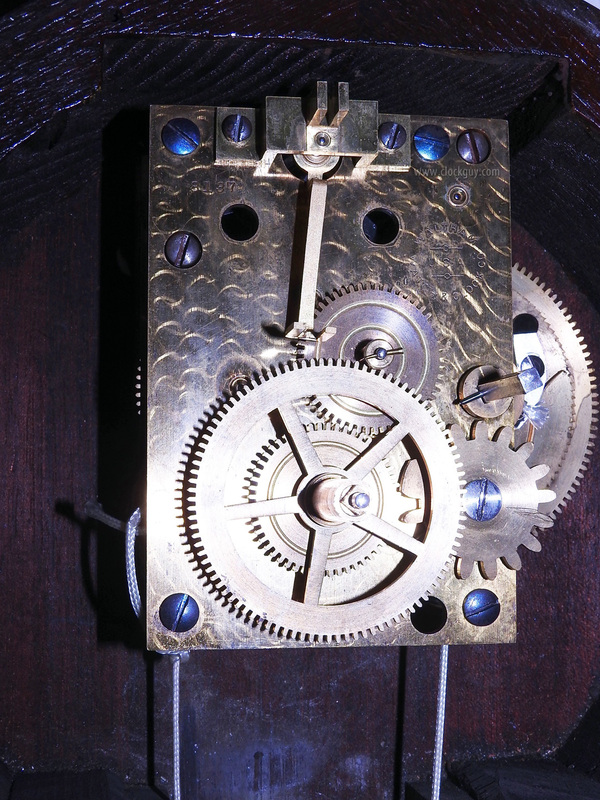 This is an early Stennes lyre banjo from the period when he was salvaging movements from Chelsea and E. Howard clocks, prior to his relationship with long-term supplier, Kilbourne-Proctor. When they were setting up the movement manufacturing business in 1971, Kilbourne and Proctor approached Elmer Stennes. He encouraged them and subsequently entered into an agreement to purchase a percentage of their production. They were delighted to have a large customer and Stennes needed them because he had run out of Howard and Chelsea movements and it was becoming increasingly difficult to find clocks that he could salvage for the movements. This clock has a high-quality and very desirable Chelsea movement. The reverse-painted (eglomisé) throat glass is in spectacular condition. This is one of at least two different lyre glass designs used by Stennes, complete with the famous bumblebee that is tucked away in the lyre and often found on the dial of traditionally shaped Stennes banjo clocks (it is rumored that Stennes had beekeeping as a hobby). Physical: The stunning mahogany case, which measures approximately 11.25"w x 41"h x 4.25"d, is in excellent physical condition and has the original finish. As with all Stennes cases, great attention-to-detail was paid to every part of the case. 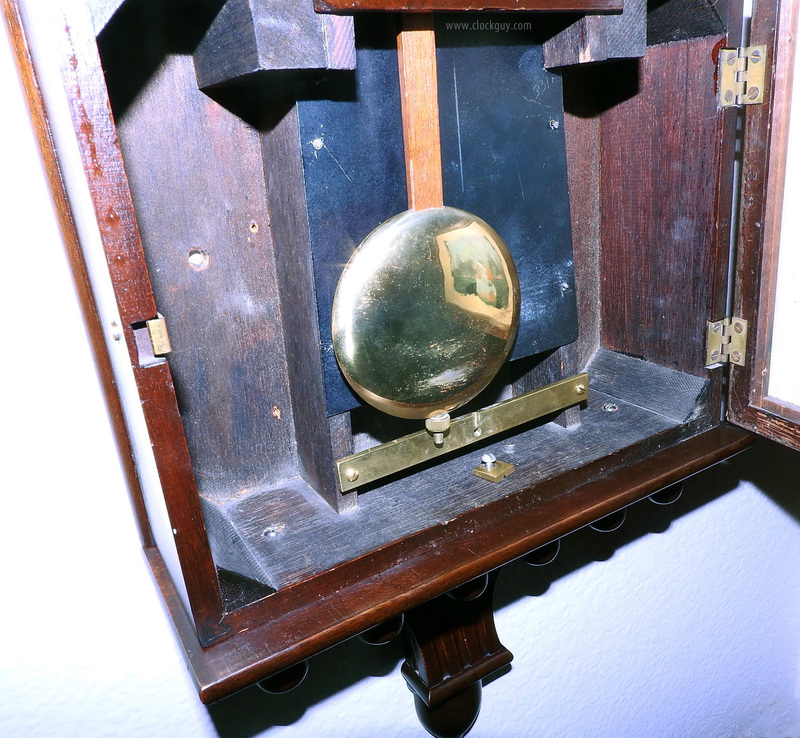 Note the birch back in the pendulum photo; no corners cut, even there. There is a tiny age crack in the wood on the second leaf near the middle of the lyre (see Midsection photo). The painted 7.5" diameter dial is original to the clock, as are the unusual hands (note the physical depth of the individual hands). As with the rest of the clock, all are in excellent physical condition. Mechanical: The eight-day weight-driven signed Chelsea movement was recently professionally serviced and is in excellent running condition. The weight is signed by Stennes. Comments: Fabulous clock with a "time-to-tell-a-story" overture that goes with it. 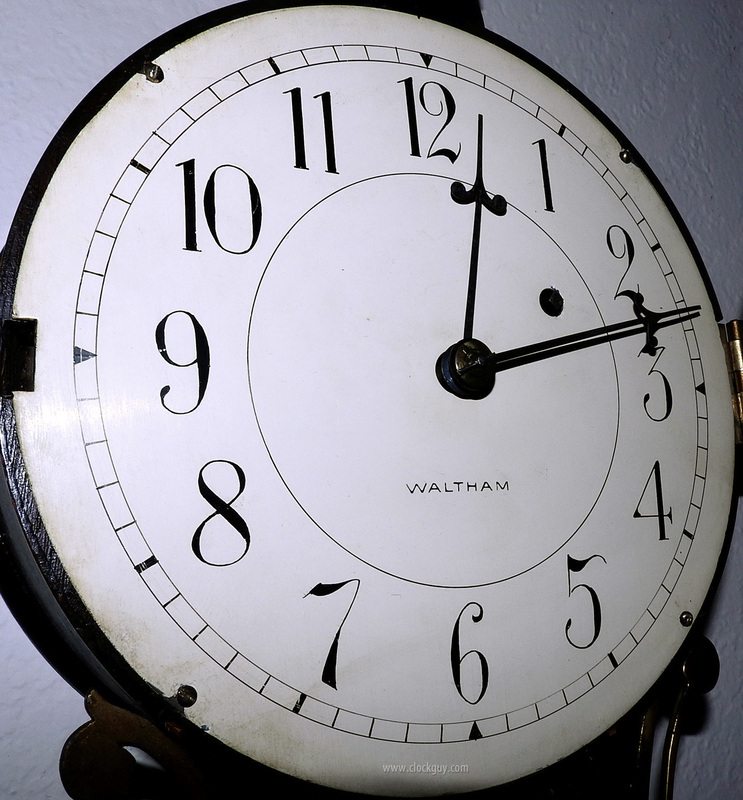 People who visit your home or office will be intrigued with the story; you'll be delighted with its beauty and timekeeping excellence. Now it is your turn: pull the trigger and give us a call! Questions? Contact us by phone at 760-604-0262, or e-mail. Waltham presentation banjo clocks are becoming harder to find as they are extremely appealing and families tend to hold on to them. We are delighted to have this one to offer for your serious consideration. 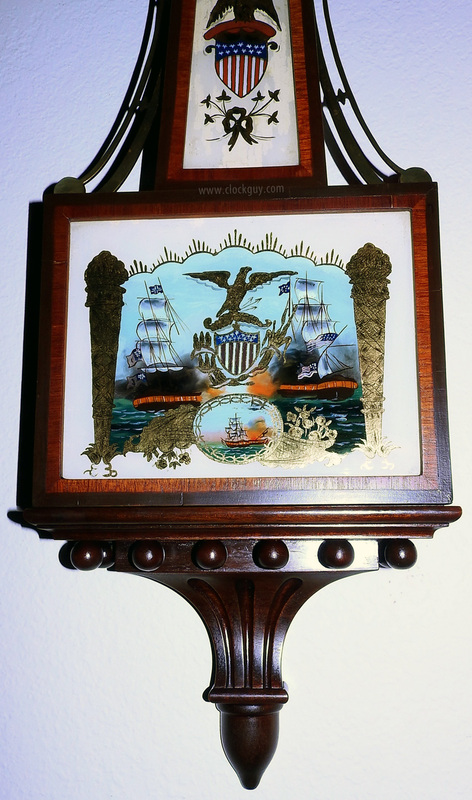 It features an unnamed American/British battle scene as was typical on banjo clocks of the 1800s and early 1900s. 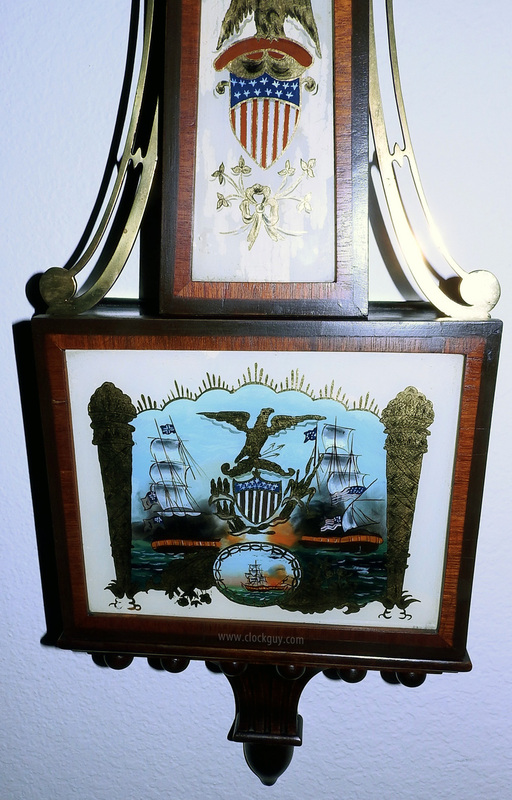 Interesting to note on this clock the two "baskets"below the ships in the tablet painting. The one on the right, under the American vessel is turned upright; the one under the British flagship, is turned upside-down. The reverse-glass artist must've had a wonderful giggle over this one! Physical: The mahogany case, which measures 42"h x 10.5"w x 4"d features the original finish and is in absolutely beautiful condition as you can see from the photos. The throat and tablet glasses are original and in excellent condition. The dial retains its original paint and is in excellent condition. 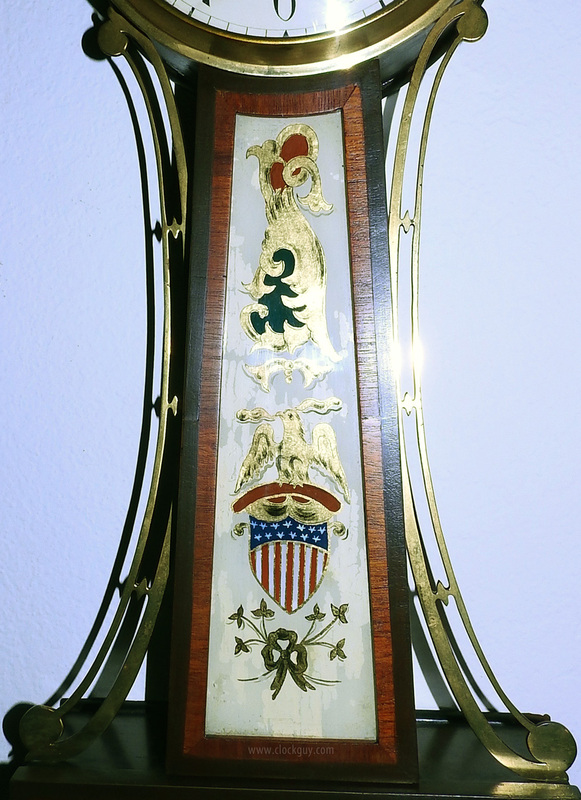 The gilding on the finial as well as the eagle itself are original to the case. Mechanical: The eight-day, time-only, weight-driven movement with "engine-turned" plates is signed and original to the case with serial number 8137. 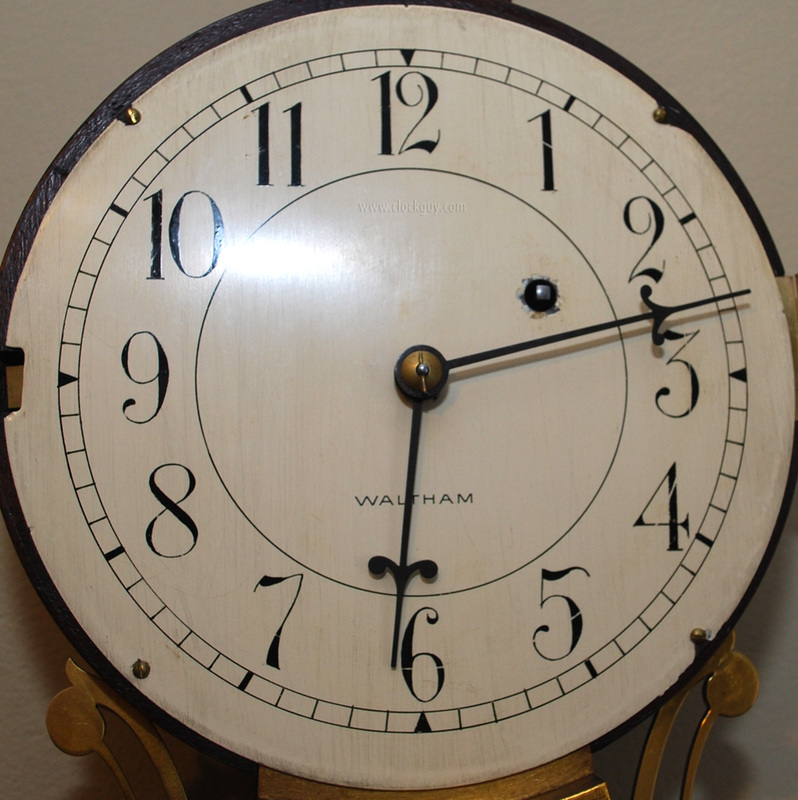 We know of no data that tie Waltham serial numbers to manufacturing date ranges, but this clock is circa 1930. 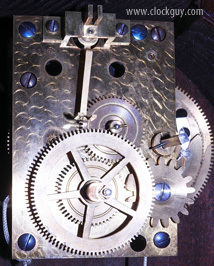 The movement, which has just been cleaned, lubricated and re-strung, is in excellent running order and has the original weight and pendulum with tie-down. Comments: Nice clock. Wonderful American naval battle scene. Great conversation piece waiting for a special place in your home or office. 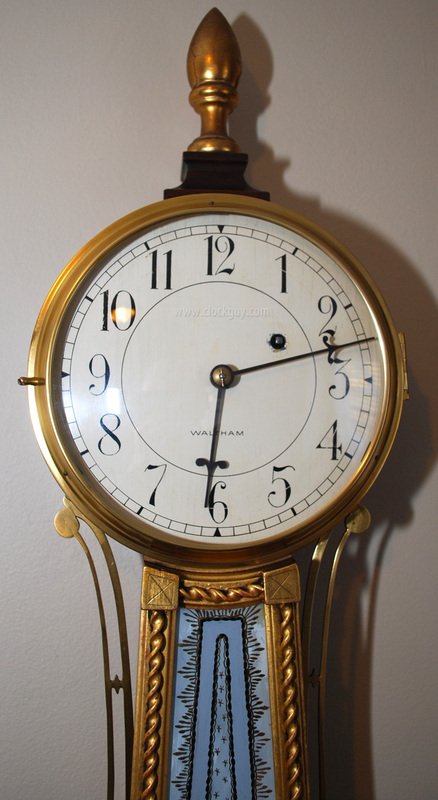 Here's a classic gilded Waltham banjo from the 1930s era, reminiscent of a much earlier period in American clockmaking. The small writing on the front of the tablet says, "Waltham's Pattern". Physical: The gold-leafed mahogany case, which measures 10.25"w x 41"h x 4.125"d is in excellent overall condition. 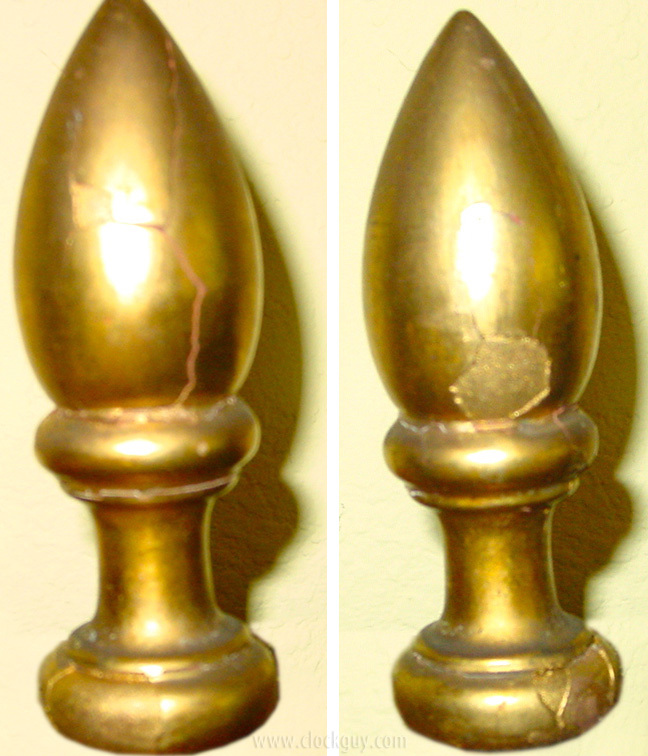 There is some gesso flaking from the back of the finial, most of which has been secured with glue, and it can be turned to the back where it is not readily visible. The Waltham-signed 7" dial bears the original paint and is in very good (age-appropriate) condition. Mechanical: The eight-day, weight-driven, time-only movement with deadbeat escapement and retaining-power has been professionally overhauled and is in excellent running order. Comments: This is not a model we've seen before. Very attractive clock, ready for that special place in your home or office.